My friend gave that to me because it was collecting dust in a corner of a band room and he was doing some spring cleaning. The other Rhodes was being used to stack sheets of music for the high school choir. I want to go back there and ask for the other Rhodes too!!!! 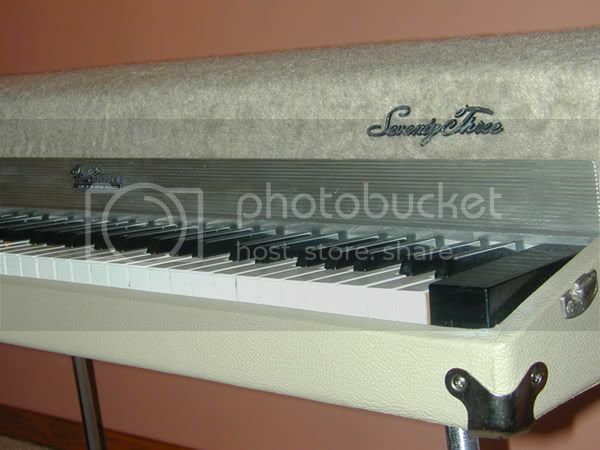 I was shocked to see a Rhodes just laying there and no one new how important this instrument is. I bought my Rhodes Mk 1 Stage 73.... Must've been two years ago now, anyways, I bought it used out of a Vintage Guitar Shop in North Calgary, the guy told me that he was selling it for some movie crew that had it refurbished and used at some point in the movie, it was some cowboy movie, he said sometihng about it, said the name, it quickly dropped out of memory. It was in great shape, I love it, use it all the time, got it all tuned up by JL at the Cantos, so it plays like a dream. I never really thought twice about it's being in a movie. That was until a few months ago somebody said a name that sounded familiar in my head, it was the name of the movie my Rhodes was apparantely somewhere in, movie wasn't just about Cowboys, but it was about gay cowboys, the movie was Brokeback Mountain It was used in a bar scene where a live band is playing, among other things, my Rhodes. That's the story behind mine. Ebay my friends. 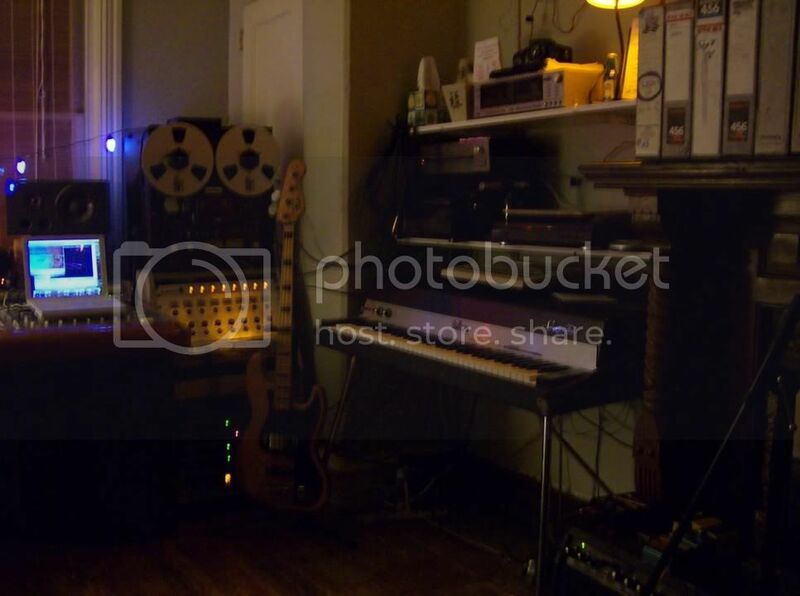 Bought a rhodes in pretty good condition with pedal and legs for $600. Did a regrom, lubed the felts, cleaned out underneath the keys and everything, polished the keys, washed the tolex, repainted the harp cover and sustain pedal black. Adjusted escapement and pickup placement back to spec followed by a voicing/tuning. Sounds pretty good so far. I'm looking at getting a MKHC or maybe that Crystal preamp in the Amps thread. I'm thinking about sanding and powdercoating all my hardware. There's a place in town that will do it for pretty cheap. I bought the rhodes because I love the way they sound and want to learn how to play piano. So far I think she's a beaut and my learning is coming along well I think! Oh god! Sorry about the massive pictures! And by the way, I play it through quite possibly the sweetest amp ever. Smallest peavy in existence. I'm saving up for a Traynor amp that sounds beautiful. 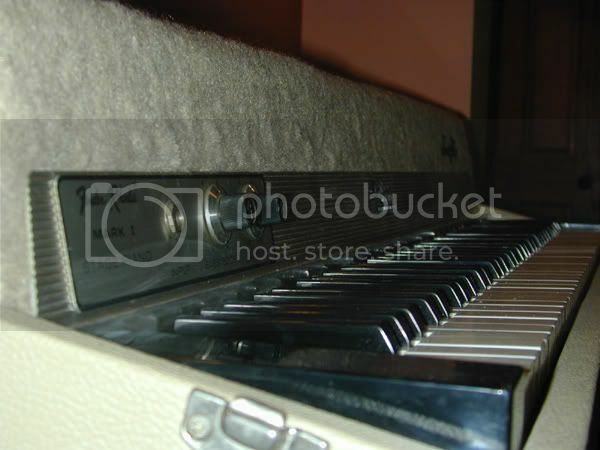 hui...that old FENDER-rhodes namerail drives me crazy everytime i see it. Mark 1a with wood hammers. Those 1972 models weren't hybrid hood-plastic with replaceable tips yet? Oops, that's what I meant. Sorry! Hey tjcombs, whats the action like on yours? Well, I haven't played many real pianos, but it seems really responsive. I would say it's pretty light compared to how most people call rhodes "sluggish" or "Heavy". I wouldn't describe it as anything like that. It might be my imagination, but it seems like the lower registers feel the way a normal piano does, and it gets lighter as it goes up the keyboard. Is that normal? Give me a few weeks and I'll have some pics of my new toy. My cousin has a groove rock band in NC (he plays guitar and sings) and works in a pawnshop in his spare time between gigs. He calls me and says that he ended up getting a near-mint (year unknown) Rhodes Mark I Stage 88 complete with legs, crossbraces, and pedal in trade for $100 and a Samick electric guitar. He said that it's still in tune, as well. This is after sitting for many years in storage in a guy's garage. I can't WAIT to get my hands on that bad boy. rocksnob, when are you gonna show us your fender contempo ? now that's what i call a rare bird, you lucky stiff! does it have that steel guitar type stand? I always wanted to hear one of those & play one & most of all own one. my next project is to procure a fender contempo & set it up next to my english vox continental and run them both thru a leslie speaker. I also have a 75' rhodes that i bought cheap & fixed up real nice, with new hammer tips, felts, bushings, and a BBE harmonic clarifier made by McClennan, beautiful sound! will send some pix as soon as i get a digital camera. This Rhodes Mark 1 was made in November/December 1976 (4776-5064). This was my first Rhodes ever, and my uncle had to make a custom crate to ship it in (from CA to CT. With the proper crate, UPS can do no harm really). I'll never forget the day I got off of the school bus (maybe back in 2002?) and literally ran to my house. When I first saw it I couldn't believe how large it was. It seemed really friggin big. And I couldn't believe how poorly the action felt. Horrible, just a nightmare. I was told that the seller had some work done on the piano in 1977, including an exciting custom brown-vinyl job on the outside. The pickups were split so that the first 24 notes were given a dedicated output (a ¼” output is drilled directly over the “R” in Rhodes). The adjustable legs we swapped with non-adjusting legs for "added stability". Many of the mid-range hammer tips were replaced with harder tips (to add a stronger attack). Unfortunately, none of these modifications translated into a better sounding and playing piano, and when it arrived in 2002, the instrument was suffering from years of serious, major neglect. My first impression of the Rhodes was a very bad one. The action was unbelievably sluggish, the individual pickup volume was completely uneven, multiple pickups were dead, and above all, the sound was not like the Rhodes I cherished. The sound was boring, flat, limp, flaccid. It was quite nasty. In 2004 I got the courage to do my first "overhaul" and make my Rhodes come to life. If it weren't for the help provided by Steven Hayes and John Della Vecchia (just to name a few), this Rhodes would still be crude and unplayable. I began by soaking every single tine in kerosene and carefully cleaning each one. I replaced all grommets, all hammer tips, re-wired the pickup scheme to a single output, replaced all of the dead pickups, replaced broken tines, and made sure the tone bars were all clean. To help the action, I added the key lift option, which helped individual key articulation and allowed me to do trills. Re-adjusted the damper arms, (arms were bent, but felt was in good shape). I lubed all points of contact. I replaced the balance rail felt and guide pin felt (which by the way, makes the action feel new again. Really makes it nice and soft). I re-adjusted the strike line because it was all out of whack. I re-adjusted the escapement to factory spec, as it had been lowered. The timbre was set to capture the more harmonic sound of the Rhodes tines. I placed the tines as close to the pickups as possible. I did this to help with the lacking sensitivity, and low volume (I know a lot of guys don't like them too close but I like it). Upon removing the wooden keys, I noticed that the first one had the date of “10/20/77” written in pencil – the date when the first “modifications” were performed. One other thing I did, which by the way happened after these sound samples were done, was remove the keybed felt, thus giving the keys a longer keydip and hammer tips further distance from the tines (there is still some keybed felt/glue remenance so the wooden key isn't actually touching alluminum). The action really isn't sluggish now, and if I had to choose, this was probably the most critical "mod" I performed because now the tines really get whaked hard and they bark loud as a result (sadly I don't have a recording to demonstrate). Well here it is, ugly and brown! Here are the respective sound samples. Tell me how you think it sounds! It's not perfect. I'll bet a REAL tech would find a number of problems. I don't get to play too many other Rhodes..at all..so I have nothing to judge it against. PS- not very good recordings at all. Quite low and noisy- for the stereo tremelo it's a dunlop TS-2. EXTRA- Here's a photo of another Rhodes I now have, which is an updated 1978 with dyno my piano mods (the 78's with the modified peds). Can't say I've ever seen one before. It sounds good- it's very different than the '76 though. One thing that really bugs me is understanding the keydip. The key dip travel is longer than the '76's was (before I removed the keybed felt) yet the keybed felt is 100% intact on the '78. I have no idea how other to increase keydip without removing keybed felt. To this day I still don't get it. Shim the action rails? It doesn't make any sense. I've looked over both of the pianos in and out, and I can't see any difference, though what I can't see might be my problem. Well in any case I hope you had a good read and a good laugh. I've enjoyed reading all of the other submissions. I especially like seeing the "Fender Rhodes" !! rocksnob, when are you gonna show us your fender contempo ? now that's what i call a rare bird, you lucky stiff! does it have that steel guitar type stand? I always wanted to hear one of those & play one & most of all own one. my next project is to procure a fender contempo & set it up next to my english vox continental and run them both thru a leslie speaker. I actually have two Contempos, though not really, one is a total parts cow (my first and disasterously unsuccesful attempt at buying one, bought it sight unseen, apparantely in :working condition" and when I got it the power supply was trashed, cosmetics s**t, all the oscillating coils were missing! only managed to get a bit of my money back from the bugger, at least I didn't really pay all that much either...). Oh well, I have nearly a full set of parts for the good one in case anything ever happens at least. Buyed for 900 euro here in my city, without tolex and really dirty, but in good mechanical condition. I've retolexed , cleaned inside and outside, now seems new The only thing i got to add are the handles. Nice work, tasters - she's a beauty! This post is all about my Rhodes Mark V Stage 73 piano. But first, some background, if you please. I must give credit to Will Ammons, good friend and keyboardist from my college band, for introducing me to vintage keyboards and organs, expecially the Fender Rhodes piano. Thank you, Will. I was in high school when my mom was given a Fender Rhodes Mark Ib Stage 73 from a local school. This was before I knew anything about the instrument, and as a consequence it sat unused in our home., and eventually my mom and I gave it away to a local recording studio; a decision I came to regret. 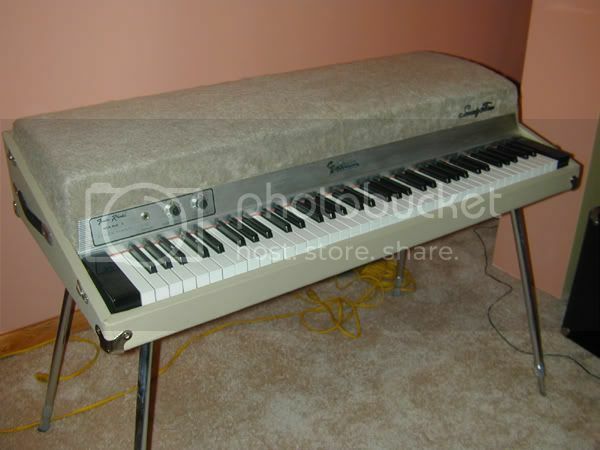 I eventually purcased my first Fender Rhodes piano; a Mark 1b Suitcase 88 for $400. What a piano! I fell in love with the stereo tremelo. I later sold it to purchase a mint condition Mark II Stage 73 (with wooden keys) for $300. I eventually sold the Mark II as well. I was playing the EVP-88 Logic Pro rhodes emulator with a MIDI keyboard and thought that I should sell the Mark II, as some tines and pickups had broken. I thought that I would be as happy with the rhodes emulator as I was with the real thing. I was wrong. After only one month of being “rhodesless” I decided to start looking for another one. I read up on the different models and decided to start looking for a Mark V Stage 73, but would also like to find a Mark 1b Suitcase 88. I knew it would be difficult to find a Mark V, and if I found one, I wasn’t sure how much it would cost. I placed 2 online WTB ads, one of which was on my personal blog. I have a Rhodes Mark V Stage 73 model that I don’t use. Everything works and I rarely use it. Interested ?? and how much is a fair price ?? I could not believe it! It turned out that there was a gentleman in Baltimore, MD who saw my WTB and decided to write to me. Based on my previous purchases, I suggested a price of $400, to which he agreed. Over the next 6 months I saw two Mark V’s sell for over $4,200 on eBay. It was in good condition when I got it, and I was able to tune it and clean it with success. I have had to replace about 4 tines, which I broke while playing it. But other than that, it has been very reliable. I plan on keeping this one for a long time. I'm going to be taking pix of the stand soon, for all those Mark V owners who are missing one, and want to see one in detail. I recorded my Mark V recently with a group, Esspaul, on the "Incomplete Fall Tour Album". The tracks are pretty much scratch, and have only drums and Rhodes Mark V on most of the songs. So, hopefully you can hear the Mark V well enough on them. The songs are listed on the right hand side of the page, grouped by Band and then Album. Since recording, I've tuned and voiced the Mark V, so it sounds better, but I think it still sounds fine in the recordings. Hi I thought I'd post mine. I have a Mark 1 73 Stage Rhodes. This was like 5 years in the making. Actually I fixed it around 2002. I re-did the tolex to a the blonde color. And the harp cover..well that's a long story. I tried to do the sparkle top but it wasn't working. The top gloss coat was peeling off so I tried to redo the sparkle but it started looking like crap. Then I decided to just get some thin "furry" fabric, slap it on the cover and call it a day. And I must say I am happy with it. I got this for about $400 but it is missing the push rod, sustain pedal, the crossbar and the case cover (which I'll get all later well except for the case cover). But everything works after a lot of cleaning and fixing the tines and pickups. I just need to solder one wire back on.